After checking I'm we headed straight to Epcot. The on property transportation is the only way to go! First thing we rode Spaceship Earth. It has been completely updated since the last time I was here 5 years ago. Then we went to The Land and road the big theatre ride. It was fun to see the dinosaurs. Then Mexico, not really my thing and the Donald Duck water ride is lame. Norway is the best. The buildings are beautiful and so are the tall blonde girls from Norway that work there. Then we went to Germany for dinner, it was wonderful. 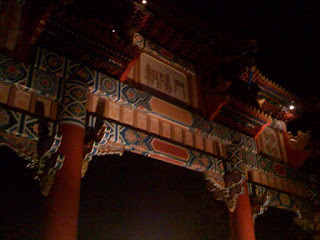 Now we're outside the China Pavillion waiting on the fireworks! I love the fireworks, whether they are in Tulsa after the Drillers game or over the lake in Chicago. We're having a good time. Tomorrow is Celeste's birthday and we're going to the Magic Kingdom. More posts tomorrow. That is great. Glad it was an easy trip. And fireworks are always the best way to end a great day. Have fun!! !